You are here: Home » Enjoy National Egg Month! May is National Egg Month, and we decided to use this opportunity to remind our loyal readers about the many benefits of eggs. Not only do eggs contain 13 essential vitamins and minerals (including vitamins A, B6, B12, D and E, as well as iron, calcium, phosphorous, potassium and more), they are also only about 75 calories. In addition, they are a very inexpensive source of protein, and can be prepared in many different ways. Since tomorrow is Saturday, I thought it might be nice to give you some ideas for tomorrow’s breakfast (egg-inspired, of course). Bon Appétit! – Sunny Side Up – only cook the egg on one side, the yolk and the white should still be a bit runny. – Over Easy – cook the egg on both sides lightly. The yolk should be a little runny, and the white shouldn’t be fully cooked through. – Over Medium – cook the egg on both sides. The yolk should be cooked but not completely solid and the white should be cooked all the way through. – Over Well – cook on both sides until the yolk is solid. – Over Hard – cook on both sides with the yolk broken until it is hard. – Overcooked – cook on both sides until the egg white and yolk are hard and starting to turn brown. 2. Scrambled Eggs – mix the yolk and the whites (or just the whites if you want to be healthier about it) in the pan as it cooks, not allowing it to come together. 3. 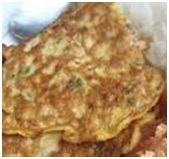 Omelets – mix the yolk and the whites together before cooking, and let them solidify together when cooked. Add cheese, breakfast meats, veggies or whatever else you like with your eggs. Fold in half and enjoy! 4. Hard-Boiled Eggs – boil an egg (still in its shell), until the yolk and white are solidified. 5. 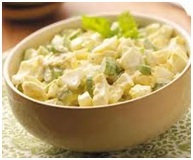 Egg Salad – hard-boil some eggs, and then mash them up with some mayonnaise, celery, and spices to taste. These are just a few of the many different ways that eggs can be prepared, and I’m sure you’ll have a great breakfast ahead of you! If you cook your eggs a little differently, or if you have a recipe that you’d like to share, post it below and I’ll cook it! And don’t forget to throw on your chef coat before making your breakfast! Happy cooking!